The ‘Cadbury Barn’, in Manor Farm Park. 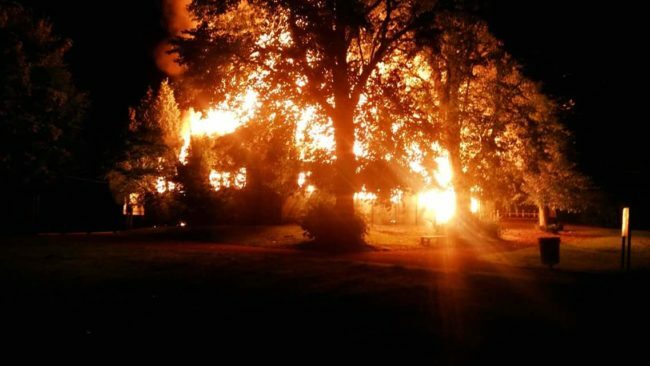 Almost three years to the day since George and Elizabeth Cadbury’s former home in Manor Park was burnt down, the iconic building that has become known as the ‘Cadbury Barn’ was also destroyed by fire. The wooden barn built in 1896 by George Cadbury was on the other side of the park but, in those days before the large trees that exist today had grown, it would have been visible from their house. George and his brother Richard were well known 19th century businessmen who began their chocolate making business in the centre of Birmingham before establishing a factory in leafy Bournville. They were staunch Quakers whose religious beliefs pervaded their working life and their paternalistic approach ensured good working and living conditions for their employees. George’s work in the Adult Schools and Elizabeth’s concern for women’s issues and hospital work meant that they never lost touch with how the working classes lived. They knew that life in the centre of Birmingham was becoming increasingly hard as industrialisation intensified, the green spaces disappeared and the air became more polluted. The working day was long, wages were low and the Cadburys knew that inner city families’ lives were very different from their own. In an effort to alleviate this, if only for a day, they organised parties at their home. These started when they lived at Woodbrooke, a large house surrounded by woods about a mile away from the Cadbury works at Bournville. They erected a large tent in the garden and the children enjoyed playing games, eating tea and roaming through the trees. In 1894, they moved across the Bristol Road to Northfield Manor House, set in Manor Farm, where they decided to continue and expand their hospitality. In 1895 George Cadbury applied for planning permission to build new farm buildings to improve the efficiency of the farm, included in which was a large barn, that was to be used, not for the farm, but for parties. Later that year on Thursday June 20th, 500 children from Stirchley School came for the first party and enjoyed tea in the barn and games in the park. The barn was wooden with a metal framework held in place with chains. The floor was tiled in red and grey terracotta with one entrance at the back and a larger wider door and wide windows looking over the park. 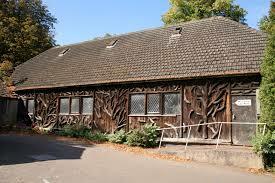 The external walls were covered with a rustic decoration which mirrored a similar barn on the Girls’ Recreation Ground just opposite the Bournville works. The Barn could seat up to 700 people at a time and in some years as many as 25.000 children and adults enjoyed the Cadbury hospitality. They came from Birmingham and the Black Country by tram, bus, by canal or on foot from Adult Schools, Sunday Schools, Mother’s Union, Brownie Revels and Scout Jamborees and many other children’s groups. These parties became almost legendary, providing so many people with happy memories that seem to have lasted a lifetime. When possible George or Elizabeth liked to attend the parties to make a welcoming speech or just watch the fun. In September 1939, the use of the Barn changed as the spectre of the 2nd World War became reality. The Barn and some of the adjacent farm buildings became the training camp for the Friends Ambulance Unit (FAU). This unit had originally been formed during the 1st World War in 1914 when a group of Quakers decided that, although their religious beliefs prevented them from fighting, they wanted to make their contribution to the war effort and offered their services alongside the troops alleviating the suffering that the war caused. Amongst these Quakers was Elizabeth Cadbury’s son Laurence, who joined an early training camp in Buckinghamshire which was to become the foundation point of the Unit. The Unit was disbanded in 1919 but when the 2nd World War broke out it was re-formed. Training facilities had to be found and Elizabeth Cadbury was quick to donate the Barn at Manor Farm for use as a training camp. The farm buildings were cleaned and altered to provide living accommodation and the Barn itself was used for the training. The fields, woods and large lake made it ideal for field training. During the course of the war over 1000 men were trained there undertaking 6 week courses before being transferred all over the world. Many written and a few oral testimonies remain of the FAU training at the Barn. The majority of them are favourable, with happy memories of the friendship and camaraderie that developed. At this time of intense patriotism, the Conscientious Objector was often shunned or badly treated but here they found support and respect amongst others who shared the same philosophy. On a lighter note they recounted how local people, including some Cadbury members took them into their homes on occasions for hot baths and coffee or a good meal. After the war the Barn was still used for a while as the FAU adapted to changing circumstances and became the Friends Ambulance Service/Post War Services which carried on until conscription ended. The parties, that had been scaled down slightly during the war years resumed, with around twenty to thirty thousand people visiting the Barn each summer. Despite her advancing years Elizabeth Cadbury still liked to visit the parties to welcome the visitors or just chat to the children. Then in 1951, after Dame Elizabeth Cadbury died, the farm was given to Birmingham City Council for use as a park. The Barn continued to be used for park visitors and groups for a while until it became a storage facility for the Parks department. In recent years attempts had been made to find funding to restore the building but sadly this was unsuccessful. Unfortunately in the early hours of the 31st July, the barn caught fire and, despite the best efforts of five fire engines, they were unable to save it.